The weather is starting to get colder and the days shorter, which can make exercising the last thing you want to do. When it’s dark outside, it’s easy to stay snuggled in your warm bed and skip your morning workout, but with all of those holiday treats right around the corner, this is no time to slack off. 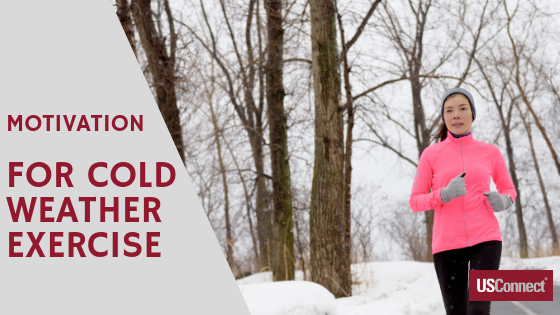 How can you stay motivated to exercise in the colder months? Set goals and make a plan. Don’t wait for New Year’s resolutions; set goals for yourself now and make a plan to meet them. Whether your goals are to get fit, lose weight, or de-stress, or all of the above, schedule your workouts on your calendar just as you would a work meeting or doctor’s appointment. Treat these appointments just as you would any other important appointment, and then get the satisfaction of marking it off your “to do” list. If it’s too cold to do your regular run, walk, or bike ride outdoors, move your workout inside. You don’t need to belong to a gym to work out indoors. There are plenty of things you can do at home to stay fit: use workout DVDs or get free workouts on YouTube. If you have the space and it’s in your budget, invest in a treadmill or stationary bike to use at home. You can also try out fitness classes at places other than a standard gym—yoga studios, dance studios, and recreation centers. They offer all types of classes that often don’t involve a monthly contract. It’s always harder to skip a workout if someone else is depending on you. Partner with a friend to work out together this fall and winter. Bundle up and head out for a walk or run together, or find something else active you can do together such as playing indoor tennis, swimming indoors at a local YMCA, or trying out a new fitness class. Remind yourself why working out, even when you don’t want to, always makes you feel better. Exercising on dark, cold days can help you keep away the winter blues by boosting your body’s endorphins. Seasonal affective disorder (SAD) is real and affects 10 to 20 percent of people, and exercise is one way to prevent or lessen its symptoms. Staying motivated to exercise throughout the colder months is challenging. Reward yourself for staying active by treating yourself to a soak in a hot bath or a relaxing massage for sore muscles. Also, make sure you are getting enough sleep.